Amon Maluleke of the Bambanani Food and Herb Cooperative and community volunteer Lekau Nkoko. Picture: Bedfordview Edenvale News. In July, as part of Mandela Day, Johannesburg City Parks and Zoo prepared the ground for a veggie garden. A man’s dream to build a legacy that will see more and more food gardens developed across the Johannesburg area, in a bid to counter increased urbanisation and food costs, is slowly being realised. Vegetables and herbs fresh from the earth are the rewards of the latest project of Thembalami Care Centre in Lombardy East, reports the Bedfordview Edenvale News. It is a food garden to supply its own kitchens and others in the community, should the harvest be bountiful. Thereafter, Josiah Ngobeni, a Thembalami gardener and his colleagues, guided and expertly assisted by Amon Maluleke of Bambanani Food and Herb Cooperative, planted seedlings. Today, green mealie plants stand tall, while the spinach is ready to be picked and pumpkin, carrots, rosemary, onions and beetroot are thriving. Maluleke volunteers his time and expertise to help establish the food garden. He is ably assisted by community volunteer Lekau Nkoko. 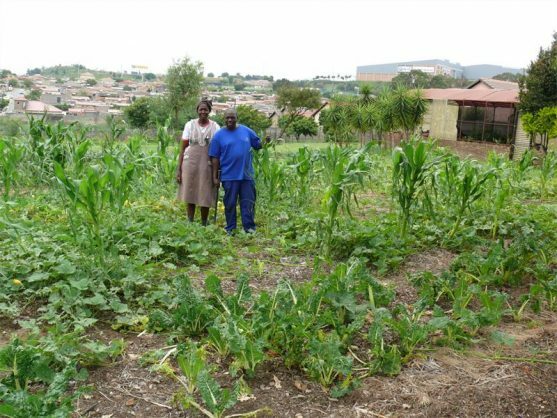 It is Maluleke’s dream to build a legacy that will see more and more food gardens developed across the Johannesburg area in a bid to counter increased urbanisation and food costs. He is a pioneer of inner city gardening, who is well-known as one of the founders of Johannesburg’s Bertrams Inner City Farm, in the shadow of Ellis Park Stadium. “He has been a godsent to us,” said Thembalami complex manager Elize Raath. Thembalami is a care centre for financially and physically vulnerable senior citizens and is run by the NPO Rand Aid Association.